Thank you for using StoAmigo Tack App. You’ve come to the right place for answers about how to use StoAmigo Tack App to remotely access and share your files. Please browse the step-by-step instructions below, and if you’d like additional help you can contact us. 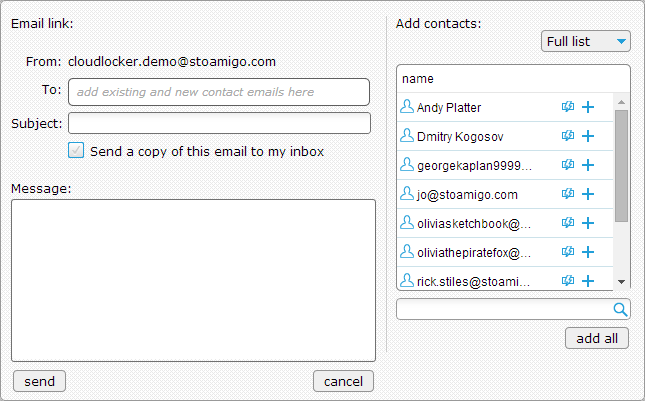 How do I create a new Contact in StoAmigo? 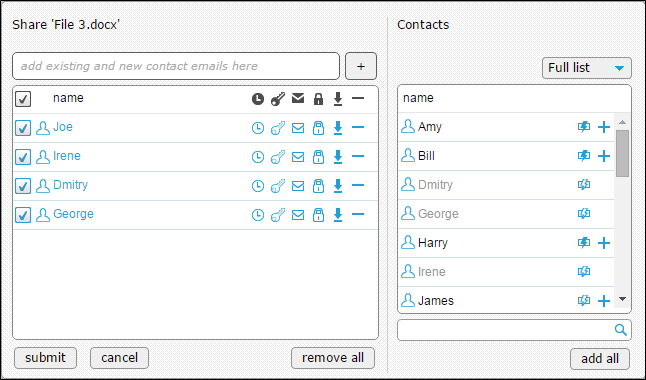 Click the Create New Contact icon ( ) located next to the Contacts drop-down menu. 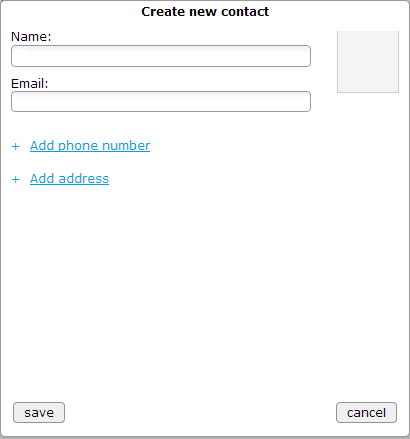 In the Create New Contact window, enter the name and email address of the person you wish to add. 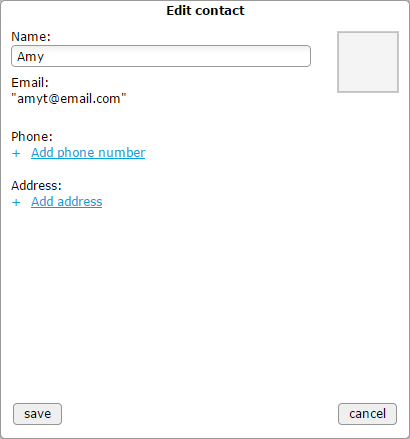 You also have the option to add phone number and mailing address, if you like. Click the Save button and you’ll see a message that the Contact had been created successfully. Your new Contact will now appear in the Contacts list and may be selected for sharing and viewing files. How do I edit a Contact in StoAmigo? Click the Action icon ( ) next to the Contact you want to edit and select Edit. When you’ve finished your changes, click the Save button and you’ll see a message that the Contact has been successfully updated. 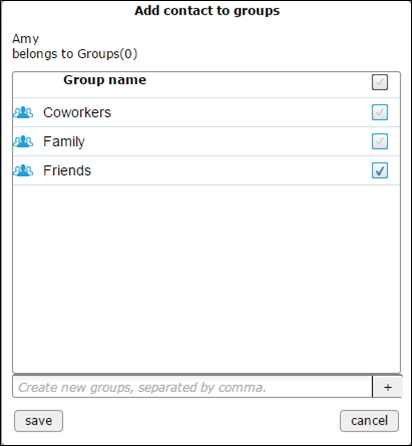 How do I create a new Contacts Group in StoAmigo? 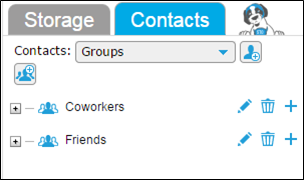 Click on the Contacts drop-down menu and select Groups. 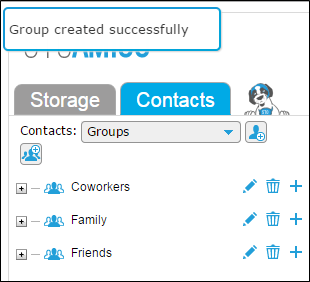 Click the Create New Group icon ( ) located under the drop-down menu. Enter the name of the Group in the Create New Group window. Click the Save button and you’ll see a message that the Group was successfully created. You are now ready to add Contacts to the Group. How do I add Contacts to a Group in StoAmigo? Click the Action icon ( ) for the contact you want to add to a Group and select the Add to Groups option. 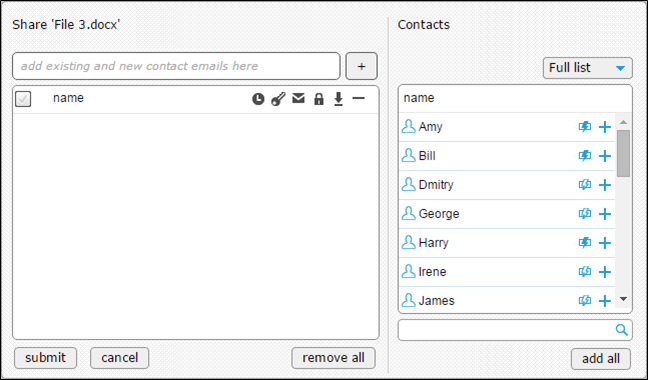 When you are finished selecting the Groups to which the Contact should belong, click the Save button. How do I share a file or folder by emailing a link? 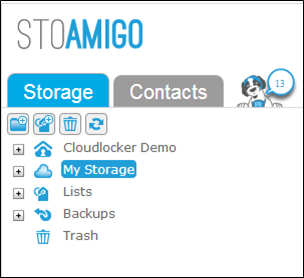 To share files on your computer via StoAmigo Tack App, you’ll need to make sure Tack App is running on your computer and that you’re logged into your StoAmigo online account. 1. Look for the Share button next to the file, folder, or list you’d like to share. 2. When you click the Share button, the Share window will open. Click on Via Link. 3. From the Via Link menu, you can decide if you’d like the link you email to your Contact to be downloadable by checking the box next to the URL Downloadable option. Or, you can make the link view only (but not downloadable) by leaving that box unchecked. 4. Click the Email Link option. 5. In the Email Link window, click the plus icon (+) next to your Contact in the list on the right to send a link via email. You can also share with people not in your Contacts list by entering their email address in the To: field. 6. If you’d like to add a subject line to your message, enter the text you want in the Subject: field. If you want to send a note to your Contacts with the link, enter the text you want in the Message: field. 7. If you’d like a copy of the email sent to you, click the checkbox for Send a Copy of This Email to My Inbox. 8. Click the Send button and you will receive a message that the link was successfully emailed. Email messages will be sent using the name and email address with which you registered your StoAmigo account. Any responses will go the email address associated with your StoAmigo account. In addition to emailing your link, you can also use it to share your content in other places, such as Facebook and other social media websites. Simply select Copy URL Link or Post to Facebook during Step 3, then follow the prompts. How do I share a file and set permissions for accessing it? From your file list, you’ll notice that every item has a Share button next to it. Click the Share button for the file, folder, or list you wish to share one or more Contacts. From the Share window, click on With Contacts. From the Share with Contacts window, click the plus icon ( ) to add a Contact with which you’d like to share this content. 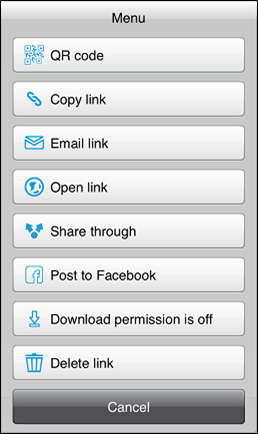 Download: You can toggle the Download permission icon on to allow each Contact to download the content or toggle it off to allow viewing only. Private: You can toggle the Private permission icon on to restrict what you are sharing to this specific Contact, so they can’t forward it or share it with others. Message: Click the envelope icon to write a message to the Contact. When the envelope icon shows as being filled in, then a message is being sent to this Contact. 2-Factor Authentication: This service requires an additional fee and may be toggled on to require both a PIN and a token to access shared content. Time-to-Live: Click this icon to open a calendar and select a date up to 3 months in the future on which access to this content will automatically expire. Dates are based on the user’s device date and expiration occurs at midnight on the date selected. To remove or change a Time-to-Live setting, you can return to this screen and either change the selected date or click the Disable Time-to-Live button. Message: This indicates if you sent a message along with the content you shared. Hover over the icon to see the message you sent. 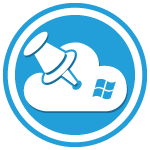 Unshare: Click this icon to remove this Contact’s access to the shared content. Note: You can also click to put a checkmark in the check box next to each Contact’s name and then use the universal icons at the top to control settings for all the checked Contacts. When you’ve finished configuring the permissions, click Submit. You’ll see a message in the corner confirming the content was successfully shared. Also, the Share button for this content will now become blue to indicate that it is shared. How do I know if someone looked at the files I shared, or if someone has shared a file with me? Look at the dog icon next to the Contacts tab. If you see a small bubble with a number next to the dog icon, that number represents the number of new Notifications for your account. Click the Notifications icon (the dog and bubble) to view your Notifications. The Notifications window gives you information about all the activity in your account, such as uploads, content other StoAmigo users have shared with you, and information about when others have opened or viewed files you’ve shared with them. 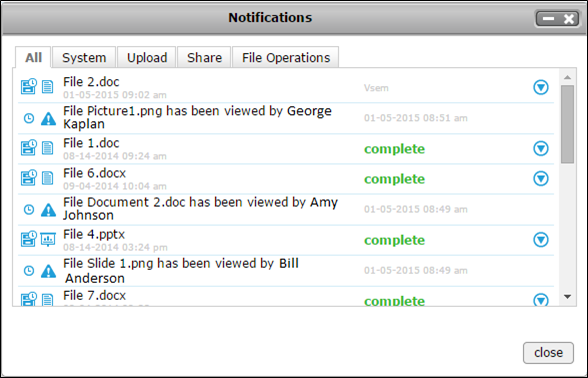 You can click the Action icon ( ) on a file that was shared with you to download or view it. You can click the Action icon on a file that you’ve shared to share it again with another Contact. All: This is a list of all your Notifications. System: This is a list of system Notifications, such as when a Contact has accessed something you’ve shared. 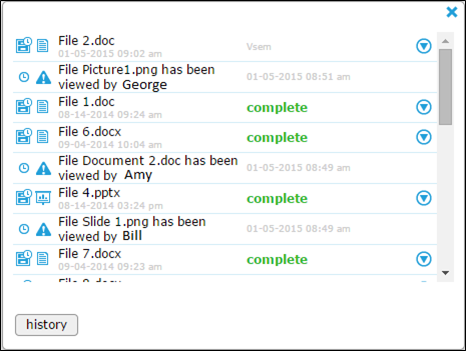 Upload: This shows a history of any file or folder you’ve uploaded into your StoAmigo online account. Share: This displays a history of files, folders, and lists that Contacts have shared with you. 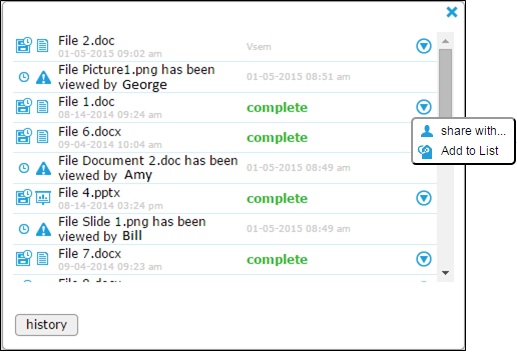 File Operations: Shows a history of actions in your account, such as copying or moving files or folders. How do I unshare or change access permissions for a file I’ve shared? If you are using StoAmigo Tack App and wish to quickly block access to your content, you can simply log out of StoAmigo Tack App or turn off your computer. Files stored and shared from your computer are not accessible when StoAmigo Tack App isn’t running or when your computer isn’t connected to the Internet. Content you’ve uploaded to your StoAmigo online account will still be accessible. There are two places from which you can retract a share or change permissions for accessing your content: from your list of Files or from your list of Contacts. 1. Click the blue Share button next to the file, folder, or list you’d like to unshare. 3. 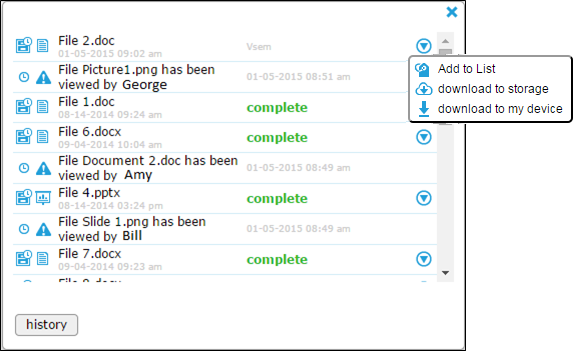 From the Share with Contacts window, click the Unshare icon ( ) for the Contact for which you want to unshare content. 4. You will be asked to confirm that you want to retract this shared content from this Contact. Click the Yes button. 5. 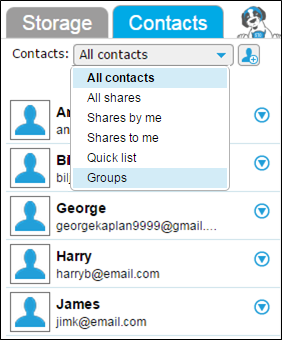 That Contact’s name will be removed from the Share section of the Shared with Contacts window. Click the Submit button and you’ll see a message that the share permissions have been successfully updated. 1. Click the Contacts tab. 2. Click the name of the Contact for which you want to change permission settings. Download: You can toggle the Download permission icon on ( ) or off ( ) to allow or not allow downloads of that content. Private: You can toggle the Private permission icon on ( ) or off ( ) to prevent your contact from forwarding or sharing the content. 2-Factor Authentication: This service requires an additional fee and may be toggled on ( ) and off ( ). Time-to-Live: Click this icon ( ) to open a calendar and select a date up to 3 months in the future on which access to this content will automatically expire. Dates are based on the user’s device date and expiration occurs at midnight on the date selected. To remove or change a Time-to-Live setting, you can return to this screen and either change the selected date or click the Disable Time-to-Live button. Message: This indicates if you sent a message along with the content you shared. Hover over the icon ( ) to see the message you sent. Unshare: Click this icon ( ) to remove this Contact’s access to the shared content. 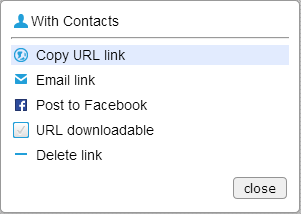 If you wish to unshare all files you’ve previously shared with this Contact, you can click on the Unshare All button. How do I upload a file to StoAmigo? If you’re using StoAmigo Tack App, you don’t need to upload any files to be able to access and share them. But, just in case you need to upload a file from another computer or device or access a file when your computer isn’t connected to the Internet, your basic StoAmigo account includes a limited amount of storage. 1. In the file list, navigate to the folder in StoAmigo where you would like to upload your file. 2. Click the Add Files button and follow the prompts to select one or more files to upload. You can also drag-and-drop one or more files from your computer into the open folder in StoAmigo. 3. You’ll see a message that uploading has begun. You can also check your Notifications to follow to progress of files as they are uploaded. It is a good security practice to periodically change your password. Users should be aware that changing their StoAmigo account password will log them out of all platforms (Tack App, CloudLocker, StoAmigo web interface, etc.) and they will need to enter the new password by logging into each platform again. 1. 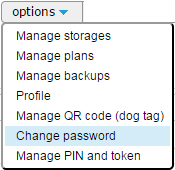 Click the Options drop-down menu and select Change Password. 2. 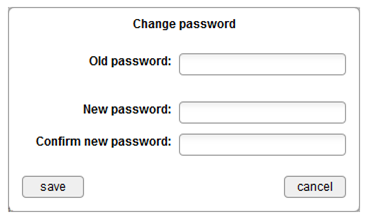 From the Change Password window, enter your current StoAmigo account password and then enter the new password. Re-enter the new password to confirm. 3. Click the Save button and you will see a message in the corner confirming the password has been changed. How do I invite someone to become a StoAmigo user? 1. Click the blue Invite to StoAmigo button. 2. In the Send Invitation window, enter the email address of the person you want to invite. 3. Click the Send button and you’ll see a message in the corner confirming the invitation was sent. Note: All email addresses to which you send an invitation will automatically be added as a new Contact, so you can quickly and conveniently begin sharing content.